This week's Illustration Friday challenge ("Launch") gave me just the incentive I needed to convert one of my older designs into a linocut repeat. 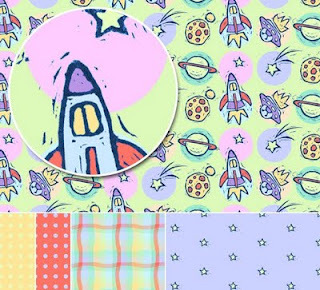 Rockets, shooting stars, planets, and spaceships zip around on intergalactic polka-dots! This could be my fave in your lovely collection of surface designs! I can imagine many applications for this fun grouping of illustrations -- and the colors are just right. Very cool, this would make an awesome wallpaper for a boys room! very cute! love your collection! Hi Kim, this is a real cute design pattern. Ya I too agree that this goes very well for a boys room wallpaper ! This is so fun and lively! Your linocuts give your patterns a nice texture and movement. They're all really charming. Really nice illustration..great palette and pattern!